New Delhi: The Supreme Court Monday declined to entertain a petition seeking a stay on a Delhi University notification introducing the semester system for under-graduate courses in various disciplines from the coming academic year. 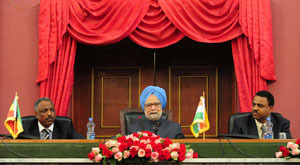 The apex court bench of Justice G.S. Singhvi and Justice C.K. Prasad said: "We are not inclined to stay the notification." Justice Singhvi told senior counsel Jayant Bhushan, appearing for petitioner lecturers, that if there was anything improper with the notification, University Chancellor and President Pratibha Patil could set it right. "The chancellor, upon satisfaction, can overrule any one including the vice-chancellor. We can't interfere at this stage," said Justice Singhvi. With the apex court refusing to stay the April 28 interim order of the Delhi High Court by which it had refused to stay the semester system's introduction, Bhushan pleaded for the withdrawal of the petition. Chiding the lecturers for going on strike, Justice Prasad said that "on one hand, you file a writ petition in the high court and on the other hand you resort to strike... This cannot be accepted." He asked as to how many students were supporting the agitating teachers. Upon being told that 3,000 students had represented against the semester system, Justice Prasad asked then why no student had come to court. The lecturers, resisting the introduction of the semester system for over a year now, challenged the interim order of the high court by which it restrained them from opposing the system by taking recourse to protest and demonstration. Bhushan earlier described the notification introducing the semester system as "arbitrary, illegal and one that was introduced without proper application of mind".